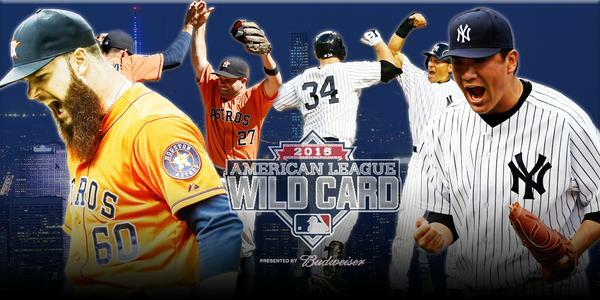 The New York Yankees were just eliminated in their first Wild Card appearance. Major League Baseball added this new game in order to bring in more revenue and increase competition in the playoff season. The Yankees missed out winning the American East league division due to their inability to catch the Toronto Blue Jays who were leading them in the division. Instead, they settled for the wild card. They faced the Houston Astros in tonight's game with Dallas Keuchel on the mount. Keuchel threw most of the game. The Yankees just got three hits off of him but could not score. Masahiro Tanaka started for the Yankees as was striking out the Astros in the first inning, but then throw pitches to them that were hit as home runs. The Astros are a team who switch at the first pitch. Tanaka miscalculated and threw strikes which were hit-able. The Astros capitalized on this and won the game 3-0. Yankee fans in the new Yankee Stadium were rowdy at first but later began to die down as they saw their favorite team crumble before them. This loss comes one the even of Sabathia's announcement that he was seeking help from alcoholism. The Yankees are now eliminated after a "drought" in regards to postseason appearances. There is no news yet as to what changes will be made to better the team whose roster for the first time since 1996 lacked Derek Jeter and others who brought the team to win five championships in the 21st century. Alex Rodriguez still has two years left in his contract, Ellsbury one. Rumors are circulating already that Yankees manager Joe Girardi may be fired. He has been criticized by fans and sports enthusiasts of over managing and allowing games to get out of control before he intervened via pitcher changes.